Alanisse Williams is a hurdler for the USD track and field team working for her degree in sport management and kinesiology. Alanisse is from Buckeye, Arizona. Bailey Zubke: Why did you choose to come to USD? Alanisse Willliams: When I came on my visit, it really felt like home. I felt comfortable. Both of my parents went here so having in-state tuition was also really nice. BZ: What are your plans after graduation? AW: I applied to graduate school for School Counseling. I have an interview this Friday so I am hoping to get in. BZ: Do you have a pre-race ritual? AW: I tend to get very quiet an hour or two before the race. I like to really focus on what I need to work on. Sometimes I like to watch videos of the pros right before to take something away from what they do and apply it to myself. Whether that’s having quicker arms or a really tight trail leg. BZ: What is your favorite part about hurdles? AW: I think that there actually is a hurdle. I appreciate the barrier in a way. 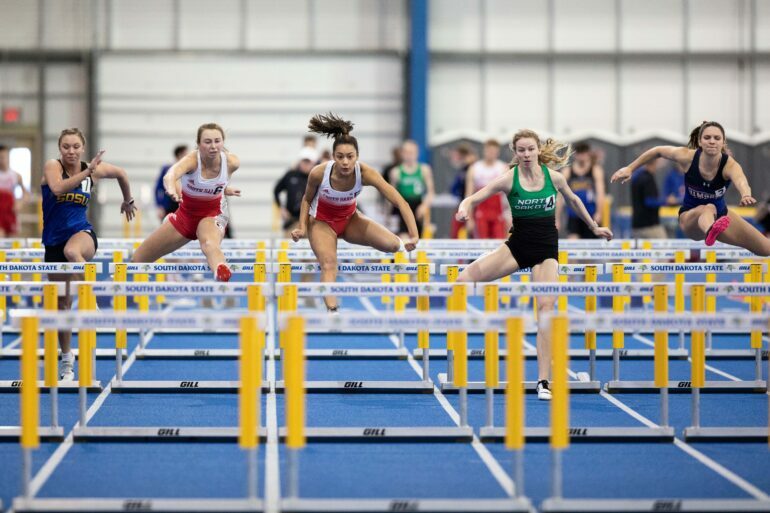 It gives me a challenge and I personally feel it’s a lot easier to run a lap with hurdles in the way than it is to have an empty lane. BZ: What is a goal of yours for the remainder of the season? AW: My goal for the remainder of the season is to just stay healthy and positive. Also to give the best version of myself to my team and coaches. If I happen to PR in a couple of my events then that would just be the cherry on top.